I was really drawn in by the cover and the summary, so I had no choice to give this a read. 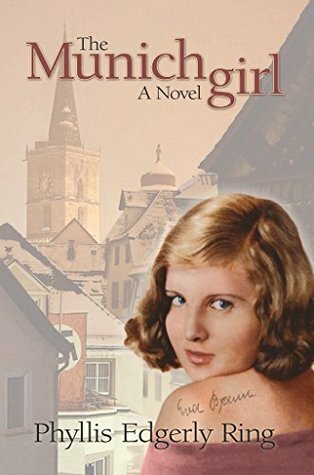 This book follows Anna who researches her mother's and Eva Braun's history with the help of Hannes Ritter. Well...I know so little about Eva Braun and I think the world really knows so little about her. A lot of the world doesn't want to know more about her because she was the lover of the Hitler who is one of the most infamous historical figures of recent history. Many historians consider her "insignificant" to history. Which is invalid, because everyone is important in some way shape or form to history. But yes, it was an interesting premise and storyline. I have to admit it took a long, long time for me to really get into the story. It was hard to like Anna because she was meek and weak. She was also really oblivious and not the brightest bulb in the bunch. Lowell, her hubbie, was the biggest A-hole. He was SO emotionally abusive to her. It was ridiculous, especially in one scene. Gah. Hannes should've punched him. Anne did get better and Hannes was okay. Also, it took so long to get into the story because of the pacing. It was super slow-paced until a certain event happened (don't want to give away any spoilers) and then I couldn't put it down and read it in one sitting. The ending was good! Can't say much else. Honestly, I want to read more about Eva Braun. Maybe something from her POV. She was an interesting person and it's crazy that she loved such an evil man. Love is blind I guess....or was it truly love? Maybe she was just trying to get herself into a safe place with the most powerful man in the land. In the end, this was okay. I loved the storyline and the premise. The ending was really good. The beginning was slow-paced and it was hard to like the characters right away. Anna got better and Hannes was okay. I totally recommend this for those that like historical fictions. Even though Eva is known to be the mistress of Hitler, there is much more to her than history remembers. Out of five stars, I'll give this 3 stars. Sounds nice and I am pretty sure there was no love between poor Eva and mister H.
I'm glad you "loved the story line and the premise" of 'The Munich Girl! Thanks very much for making time for the book, Carol Rae. Ana, Mister H had lust and Eva just dealt with it. He didn't want to marry her. No real love there. Teddy, thank you for including me in this tour. Leafphylss, thank you so much for including me and sharing a good book! B, gotta do what you gotta do.